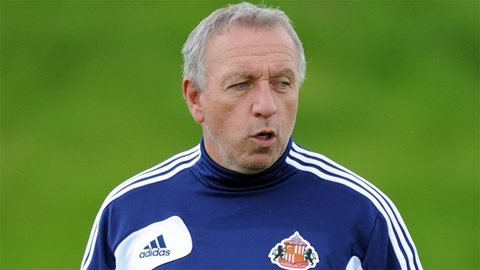 Sunderland coach Ged McNamee saw his side thrash Spurs. Sunderland shocked Tottenham Hotspur by running out 4-1 winners as Spurs squandered the opportunity to go top of their division. They were undone by goals from Ethan Robson, an own goal and a Rees Greenwood double and were blown away after taking the lead early on. Shayon Harrison grabbed Spurs’ 19th minute opener but the Black Cats proved too strong as Tottenham crashed to defeat. Fulham went top on goal difference after they hit six past Blackburn Rovers. Jordan Evans, Emerson Hyndman (2), George Williams (2) and Patrick Roberts – who scored a hat-trick for England under 17s midweek – netted for Fulham. Fulham and Spurs now share 28 points at the top of the southern division but both have two games over the three teams behind them, which include Chelsea and Aston Villa. Sunderland’s win ends a run of three games without a victory and pushes them into 6th in their northern group. Everton are creeping up behind Manchester United at the top of the table as they lie one point behind with a game in hand. They took full advantage of their match against lowly Norwich City this weekend by sealing all three points away from home. Courtney Duffus scored the only goal of the game but coach Kevin Sheedy insisted it should have been more. He said: “We were very good in the first half and got the goal through Courtney that we deserved. “We probably should have had one or two before that because we missed a couple of good chances, which is frustrating because we worked on finishing in training. “But we continued to dominate and while Norwich improved after half time, we had opportunities to kill off the game with a couple of good chances. Southampton 0-3 Man City, Tottenham 1-4 Sunderland, West Brom 0-3 Middlesbrough, West Ham 1-1 Newcastle, Aston Villa 2-1 Stoke, Fulham 6-0 Blackburn, Leicester 3-1 Bolton, Norwich 0-1 Everton, Reading 2-4 Liverpool.